“The Joy of the Lord Is My Strength” from Christian Faith Publishing author Michael Soppeland is a captivating work that embodies a heart of praise and exaltation, drawing inspiration from Scripture and thematic songs whose lyrics preface every chapter, all while contemplating aspects of Christian life—such as the power of love, life’s purpose, the pursuit of happiness, undeserved forgiveness, contentment, and waiting on God. 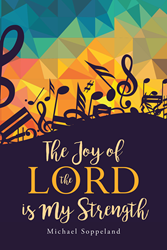 “The Joy of the Lord Is My Strength”: a vibrant and music-filled collection of essays about life. “The Joy of the Lord Is My Strength” is the creation of published author Michael Soppeland, a semiretired Lutheran pastor in Iowa, Wisconsin, who has written hundreds of articles for his church, has served on numerous boards and committees, and whose first book, “The Weary Pilgrim,” was published in 2016. Published by Christian Faith Publishing, Michael Soppeland’s new book is a joyful and richly introspective look at life through the eyes of a Christian with the sensitivities of a music-lover, as the author delves into the timeless topics that prevail in many of the most enduring songs of all time. Titled after the Bible verse Nehemiah 8:10, Soppeland shows how one can brave through life’s challenges with song and dance, as the ancient Israelites had. View a synopsis of “The Joy of the Lord Is My Strength” on YouTube. Consumers can purchase “The Joy of the Lord Is My Strength” at traditional brick & mortar bookstores, or online at Amazon.com, Apple iTunes store, or Barnes and Noble. For additional information or inquiries about “The Joy of the Lord Is My Strength”, contact the Christian Faith Publishing media department at 866-554-0919.